Brennon Jones started his 'Haircuts 4 the Homeless' mission on January 19, 2017. 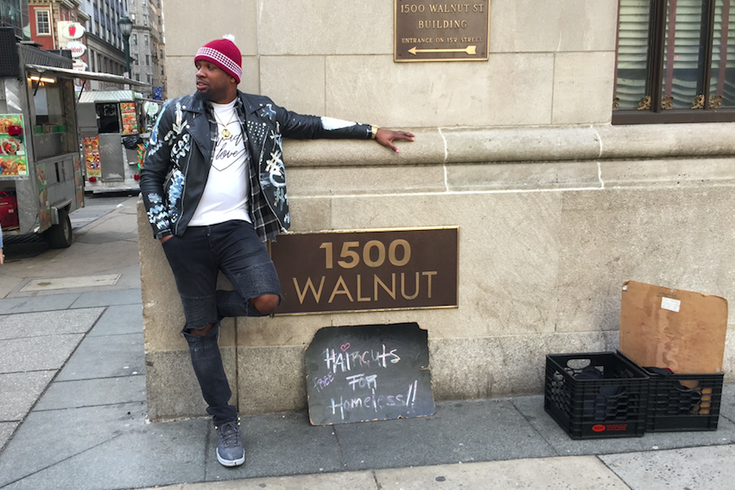 On the one-year anniversary, he returned to the place where it all started (15th and Walnut streets) to reflect on the past year. When I walked out of PhillyVoice’s world headquarters to grab lunch one year ago today, I looked across 15th Street and saw something peculiar. At the southwest corner of Walnut Street, a barber was cutting someone’s hair right out on the sidewalk. It’s part of the journalist’s code to – at that point – delay the meal to find out what the heck’s going on. What the heck was going on turned into one of Philadelphia’s best feel-good stories of the year. The barber’s name was Brennon Jones and, in the time since he gave that first haircut to a man named Braden Day, his “Haircuts 4 the Homeless” mission has gone viral to levels impossible to predict in those early days. • Jones has toured American cities. • He’s been the subject of a documentary film. • He’s appeared on "The Rachael Ray Show." • And, thanks to a fellow barber who was so impressed by his kindness, he now runs a barbershop of his own on Old York Road in Olney. On Friday, he returned to where it all started to say thanks to everybody who made it possible. He said that the barbershop – Phenomenon Perfection Hair Studio – is still building strength, a level of growth spurred on by a lot of people just coming in out of the blue. He cuts hair for the homeless in that shop one day a week. Meanwhile, he’s planning another tour in May, including a return to Atlanta, and a trek out to Las Vegas and California. With that quick update – in which Jones made it clear how much the wide network support helped make it all possible, he headed off through Center City to find people who need a free haircut. He stopped counting the number of free cuts he’s given, estimating it at 1,000 to 1,200 between his outside work and cuts in the barbershop. But the one he gave outside the H&M at 16th and Chestnut streets on Friday stood out.